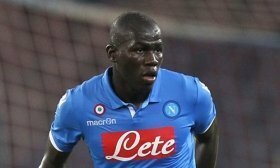 The Senegal international only penned a new long-term deal with Napoli earlier in the summer, but United are still said to have made an approach for the centre-back to show their transfer backing towards Jose Mourinho, who has since been sacked from the head coach position. Speaking to Tuttosport, De Laurentiis acknowledged that United failed with a bid of around £95m for the defender whom Mourinho had planned to recruit during the forthcoming transfer window, he said: "Mourinho wanted him, we rejected £95 million." Furthermore, De Laurentiis stressed that the club are unlikely to entertain any renewed offers for Koulibaly and United may have to look elsewhere to strengthen the central defensive department when the transfer window reopens next month. Tottenham Hotspur's Toby Alderweireld has been earmarked as a probable option with his contract running down in 18 months' time but it remains to be seen whether Spurs would entertain the prospect of strengthening a main league competitor during mid-season.